We inventory a full line of reconditioned and new thread protectors offered in API and Premium connections. Sizes range from 1" thru 20". Protectors are offered in plastic and heavy duty composite material. Samples of our recondition protectors are available upon your request. Marathon Protectors can also custom design molds to fit your custom parts. Please contact our office personnel to discuss your needs. Marathon offers a complete line in standard weight thread protectors for tubing, tool joints, and casing connections. It's an economical way to cover your tubular threads during shipping and storage. Our new and reconditioned heavy duty protectors offer superior protection against impact, shock, and storage corrosion. Inventory sizes range from 2-3/8 through 20 inch available in both API and premium connections. We stock a full size range and thread profile in cast steel protectors. Provides thread protection and assists in handling drill collars, pipe and drill bits. Sizes are available from 2-3/8'' through 8-5/8'' in API and Premium connections. Proof load test certificate available upon request. 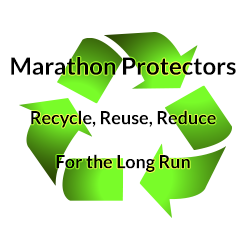 Marathon Protectors has been reconditioning casing protectors for over 29 years. We also offer recondition tubing and tool joint protectors in both API and premium connections. Marathon offers a full line of heavy duty protectors for premium connections. No minimum order requirements for premium connections. Marathon Protectors carries a polyisoprene elastomer spiral wire line wiper. It effectively cleans the wire line of any foreign substance accumulating on the line, which can be blown onto equipment and derrick floors. It is easy to install, automatic in operation and will prolong the life of the wire line. Polypropylene bags. These sacks are a cost effective method for handling excess thread protectors on shore base and drilling locations. Advantages are elimination of drums and pallets, free up baskets and storage containers, time reduction in loading excess thread protectors, environmentally safe for short periods of storage, and identification on different well charges. Don't know if you need Box or Pin Protectors?